He came to the Portland, Maine area (at the time known as Falmouth) as part of the migration that took place in the 1820's. I am not sure exactly when he arrived. He died April 1744. I am descended from his daughter, Christian Simonton, who married William White. This Will is a great proof point that the Christian Simonton who married William White was Andrew's daughter. Never hurts to have proof of family relationships. In the name of God, amen, I, Andrew Simonton, of Falmouth in the County of York New England - Yeoman, being weak of body, but of sound judgement blessed by God, considering the frailty of my nature, do make this my last Will & testament renouncing and making void heretofore made. Imprimis, I commit my soul to God which gave it hope at the Resurrection to receive immortal glory and my body to be buried in a descent manner at the discretion of my executrix hereafter named. Second, I give my dear and loving wife, Ann Simonton, my executrix & during her natural life, she shall have the improvement of all & singular of my estate. Item, I give unto my well beloved son, William Simonton, my part or portion of all ye farm I now dwell on to him and his heirs forever. Item, I give to my loving son, Walter Simonton, ten pounds old tenor. Item, I give to my loving son, Andrew Simonton, ten pounds old tenor. Item, I give to my loving daughter, Christian White, ten pounds old tenor. I order my loving wife at her death to order & dispose of the rest of all my estate real & personal among my children to all above written. I have hereunto signed, sealed published & declared this to be my last Will & testament witness this 25th day of April in the year of our sovereign King George annoq Domini 1744. The Good, The Bad and the Frustrating. My experience with AncestryDNA. I was one of the early guinea pigs to pay to try Ancestry.com's latest DNA service, AncestryDNA. The new offering really appealed to me for several reasons, but the most compelling was the ability to find male and female relatives through Ancestry.com's new process of being able to tell the degree of relationship between you and other people pursuing their family histories. 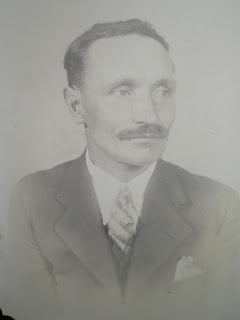 As anyone who has read my blog will notice, I have dug deep into my family history and continue to find great stories. There is one line in my family which has been a total mystery to me, my father's father's family. My father was adopted. I have uncovered his mother and have been researching his mother's family. However, there is no record of his father. AncestryDNA may be the only chance I have to try to track down any connection to my dad's father's family. So I do have high hopes for the results from AncestryDNA. Taking the test is very easy. They send you a kit with explicit instructions on how to provide a "sample" to send to them. You collect saliva and gently drool or spit it into a vial that you send back to Ancestry.com. It sounds a lot grosser than it is. Then you wait. It took a little over a month to get my results. I think it may be faster now. My results came back July 11, 2012. I immediately followed the link to the results on Ancestry.com and linked my results to one of my several family trees. 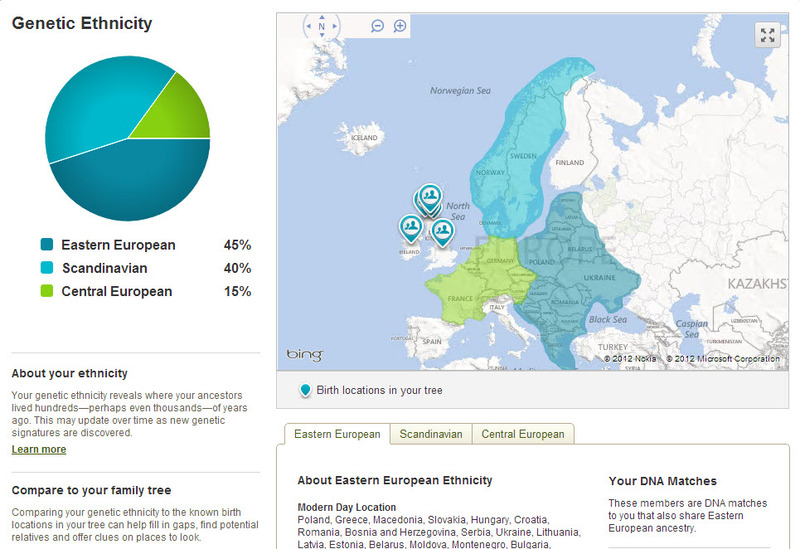 They showed that my DNA indicated that I was 45% Eastern European, 40% Scandinavian and 15% Central European. My research indicates that my mother's family was from present day Poland/Ukraine (which would count as Eastern European) and Germany (which would count as Central European). The results seem to capture this part of my ancestry, but I am not sure I understand the percentages. But what about the 40% Scandinavian heritage? The part of my father's family I am aware of is almost exclusively English, Scottish and Irish. Not a 6'5" tall, blond anywhere to be found. My DNA was telling me that I had no lineage from the British Isles. Regardless of my research, I knew I had a British lineage. My dad had very red hair and as as family, we don't tan very well. Where else could we be from? As it turns out this is a common complaint about the AncestryDNA results. There have been quite a number of people who have received their DNA results that believe them to be in error, because they know they have British heritage and the DNA results state Scandinavian. An interesting fact about the history of Great Britain is that it was invaded multiple times by the Vikings in 8th and 9th centuries. The good folks at AncestryDNA use the instances of Viking influence in the British Isles to explain the results. I guess I have to trust them on this, but it does sound unlikely. I must have 100's or 1,000's of British ancestors and the fact that most or all of them were of Scandinavian descent seems unlikely. Of course, I don't know about my dad's birth father, so that is a wildcard to my DNA. Another good thing about the AncestryDNA results.......are they keep coming. Almost daily, I can see that there are additional people that show up on Ancestry.com as being DNA relatives. 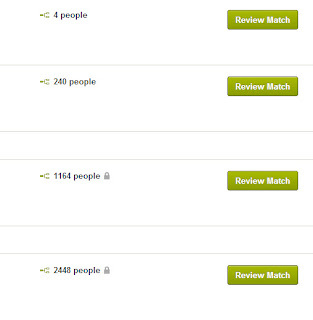 Since July 2012, close to 400 DNA matches have appeared. AncestryDNA is supposed to help you connect with unknown relatives. Ok. Where are the close relatives? I don't expect a long lost brother to show up, but someone that I can connect to my family somehow. Of those 400 DNA matches, about 120 were better than 8th cousins. These matches are described as being "moderate confidence" of a match. To put that in perspective, it would mean that as 5th cousins that we share a great-great-great-great grandparent. As it turns out most people haven't been able to complete their family trees to their great-great-great-great grandparents. So it is very difficult to find how are families are connected. I am sure I am not the only one to experience this. My closest DNA match results are 4th cousins. I have 8 of those matches. We share a great-great-great grandparent. Of those 8 "close" matches, I haven't been able to find any genealogy evidence of family connections. Thomas Woodbury with that person, our 7th great grandfather. I am disappointed with not finding any close relatives, but it is ongoing and I have hope that a breakthrough will come. I will update this post when and if I find any great matches. My frustration has more to do with how other Ancestry.com members "use" their AncestryDNA results. It seems reasonable to assume anyone who pays to get their DNA information will be interested with finding and potentially connecting with unknown relatives. If so, they aren't making it easy. Private Family Trees - I see I have new DNA matches, but they have made their family trees private. Only the tree owner or people they invite to see their family trees can see them. So I can't see how we are related. I can send them a message and they may invite me to view their tree, but since most of the DNA results haven't had a known connection, I don't want to be sending 100 or so requests to strangers to see their trees. It gets a bit unmanageable. Small Family Trees - I have been seeing a lot of trees with DNA results with less than 12 people in them!! With completed family trees this small you are only going to connect with people you know. Not sure the purpose of participating in AncestryDNA with a tree this small. I have two 4th cousin matches where one tree has 4 people and another has 16 people. I can suspect where we are related, but I almost feel compelled to do research for them to complete their family trees so we can prove some kinship. No Family Trees - Ok, having 4 people in a tree is not optimal, but some people have NO TREES! Ugh! Nothing attached to their DNA results. One of my 4th cousins.....no tree. Nothing. Very frustrating. In some cases, they have trees, but haven't associated the DNA results to any of their family trees. No Response to Messages - Since I have about 400 DNA matches, I don't try to contact everyone. I try to target the ones that seem likely to be closely related. 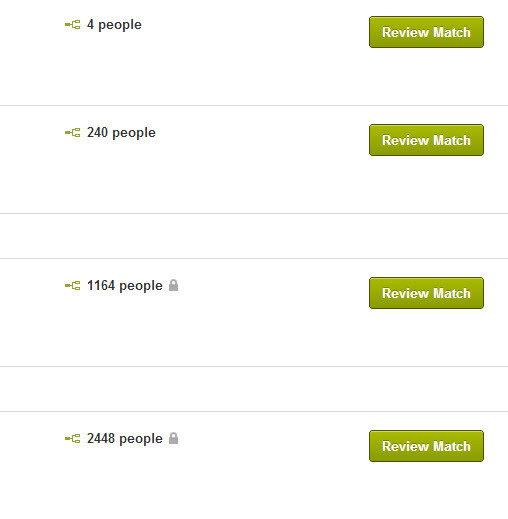 I have contacted all of my 4th cousin matches. Of those 8, I have received responses from 3. Now, not everyone is as interested in connecting with relatives as I may be, but it does seem to be the reason why you would participate in AncestryDNA. It is possible that many participants are only interested in connecting with 2nd or 3rd cousins and aren't interested in connecting with someone so distantly related. Who knows. My overall assessment is I am glad I am participating in AncestryDNA and that I expect that eventually an amazing match will emerge. The one that will open up some incredible insights into the family history. Everyone's results will vary, so your experience could be very different from mine. AncestryDNA does have it drawbacks, but the offering is still fairly new and I have faith that the good folks at Ancestry.com will continue to improve and enhance it. 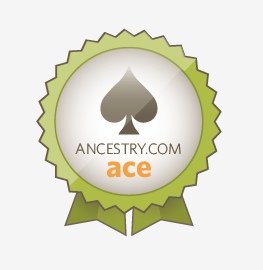 My suggestion to Ancestry.com would be to provide guidance to AncestryDNA participants about how to get the most out of their DNA results. Everyone's DNA experience could be improved if they made their family trees public and they be open to connecting and corresponding to other DNA matches. If you decided to take the DNA plunge, good luck! You never know, maybe we are related. Mystery Monday - How are the Purcell's of Utica related to the McGraw's of Syracuse ? This is a mystery I haven't solved, yet. We know that Patrick Purcell arrived in Utica, NY about 1850 and lived their until his death. When he arrived the family lore indicates that he lived with some relatives. But who? We know that at least three of his sisters also arrived from Ireland and lived in central NY, but I suspect they arrived a few years after he became established. To be honest, I hadn't spent a lot of time contemplating this mystery until I came upon a newspaper that mentioned that Miss Margaret Purcell and Mrs John Lynch (Patrick's sister, Julia Purcell) attended the ordination of Reverend John McGrath of Syracuse in Troy in May, 1896. This caught my attention. Troy is about 90 miles from Utica and a multi-day journey by horse or possibly a half day by train (assuming there was a train that connected Utica and Troy). My point being is that not a trip someone would undertake lightly. Not likely you would make that kind of trip for a friend. Most likely a relative...probably a first cousin at most. I conducted some research on Rev John McGrath. Nothing. 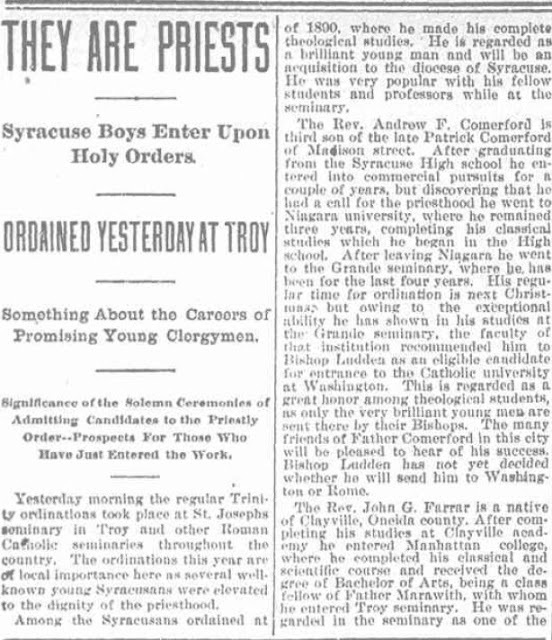 I tried to find the ordination class of Troy in 1896 and did uncover that the Utica NY paper had published the name incorrectly. It wasn't Rev. John McGrath it was John McGraw. It is my understanding that in Irish that McGrath is pronounced like McGraw and this may explain why John's family adopted the McGraw spelling. 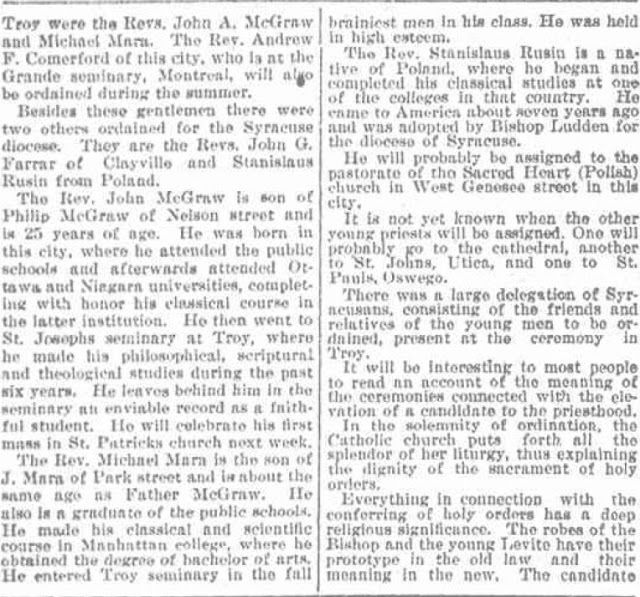 I have been able to uncover a little bit about John McGraw's family, but not the connection between the two families. John McGraw (1870-1935) was son of Philip McGraw (1844-1922) and Margaret (last name unknown). Both Philip and Margaret were born in Ireland, so it seems likely that the Purcell family is related to Margaret's family. Not only did John become a priest, but so did his brother, James (1876-1938). In addition, John had two sisters: Mary McGraw and Margaret McGraw. Margaret died unmarried inn 1951. Mary McGraw (1875 - 1941) married David Burke in 1895. Together they had 11 children: David, Thomas, Edward, Francis, Mary, Joseph, Ambrose, Alice, Vincent, Philip and Margaret. 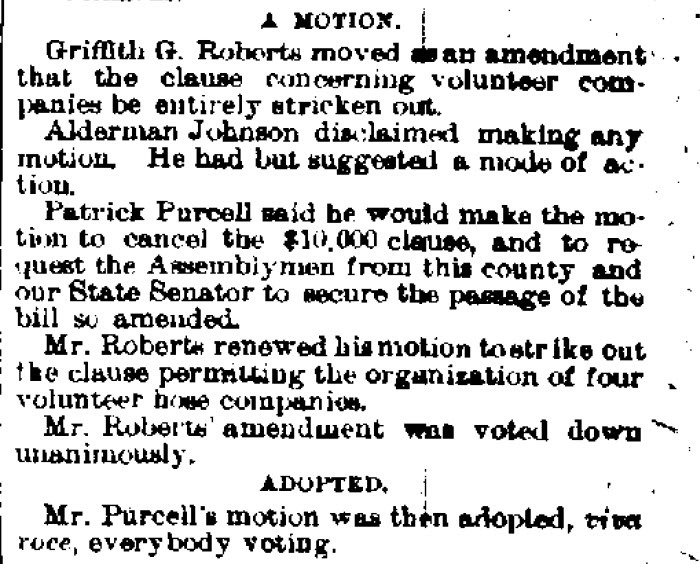 Another indication of the relationship between the McGraws and the Purcells is from an Syracuse newspaper personal section which stated, "Miss Ellen Purcell (Patrick Purcell's daughter) of Utica is the guest of Miss Margaret McGraw". My recent efforts to trace the Purcell family back to their roots in Tipperary, Ireland. As you will note from previous posts on the Purcell family, they are said to be from Upperchurch, near Thurles in Tipperary. However, when reaching out to genealogical resources in that area of Tipperary, they haven't had any luck finding any records for Patrick's family. I have turned some of my research efforts to find where Philip McGraw and his wife Margaret may be from in Ireland to see if this provides more hints of the origins of the Utica, NY Purcells. If you have any information about the McGraw's of Syracuse, please email me. 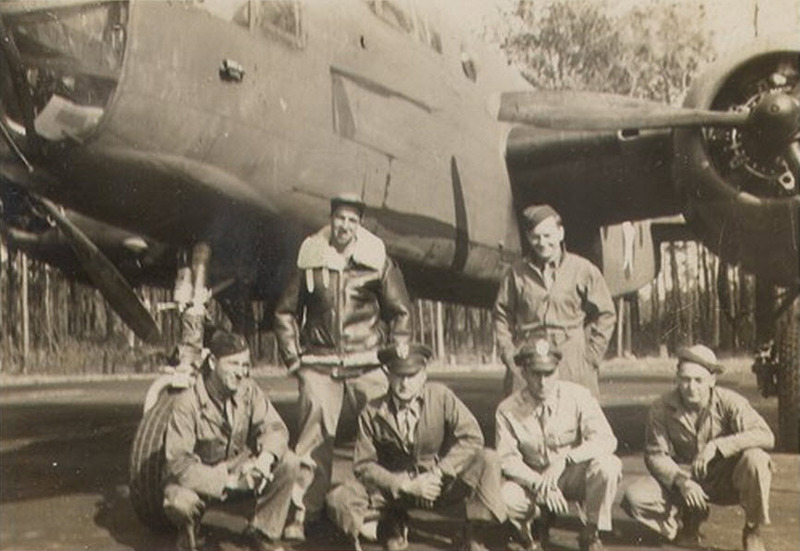 My great uncle, James Albert Kurtz was 2nd Lieutenant in the 57th Bomb Wing, 310th Bomber Group, 381st squadron. He flew in 27 missions before he died in a training flight over Tunisia, North Africa on November 4, 1943. I was able to uncover the records of his missions, their targets and their results and I want to capture them here to honor his war service. James Kurtz was born on September 5, 1918. He enlisted in the Army Air Force on September 16, 1939 and graduated from the cadets at Maxwell Field, Alabama January 14, 1943, where he was commissioned as a 2nd Lieutenant. He was sent overseas in April 1943. He was a co-pilot in B-25 bombers based in Oudna, Tunisia. 18 B-25’s escorted by 36 P-38’s went on a bombing run over Sardinia, Italy. There was heavy flak. Most of the aircraft were hit. One of the B-25’s engines caught fire, causing him to make a landing in the sea 15 minutes from the target. Air-Sea Rescue Service was notified to save the crew. 18 B-25’s escorted by 24 P-38’s went on a bombing run over Biscari, Sicily, Italy. Due to low visibility and terrain difficulty for the navigators, the bombs for this mission struck all over the country-side. 36 B-25’s escorted by 24 P-38’s went on a bombing run over Vibo Valentia Airdome, Italy. A six hour trip to the toe of Italy via the south coast of Malta, in order to avoid our shipping. The mission paid big dividends, as all bombs hit in the target area, destroying many of the 50 or more aircraft parked on the airdrome. Buildings and hangers were also hit, and several oil fires were started. 72 B-25’s escorted by 36 P-38’s went on a bombing run over Ciampino Airdrome, Rome, Italy. 35 enemy aircraft were dispersed on this mission and 10 destroyed on the ground. No bombs struck in the center of the city. 24 B-25’s escorted by 26 P-38’s went on a bombing run over Battipaglia, Italy. The marshaling yards were hit by only two strings of bombs. The remainder hit wide, mostly in the small town. 36 B-25’s escorted by 24 P-38’s went on a bombing run over Practicia Di Mare Airdrome, Italy. Apparently the enemy was taken by complete surprise, for in addition to the 80-100 large aircraft on the ground, 3 were in the process of landing when the bombs hit. 24 B-25’s escorted by 26 P-38’s went on a bombing run over Crotone Airdrome, Italy. The bombing was only fair –several strings did strike in the center of the landing area, but others were short and to the sides. Bridge area covered, but direct hits observed due to dust and smoke. 36 B-25’s escorted by 24 P-38’s went on a bombing run over Littorio Railroad Yards, Rome. This mission was part of another combined big push by the air force to tie up rail traffic to and from Rome. All planes returned safely. 10. Road Curve Between Palermiti and Valepiorita, Italy 8-18-1943. A “Milk Run”. No Flak, no enemy fighters and no direct hits on the road. Good bombing with no enemy aircraft interception. 36 B-25’s mission to block retreat of enemy motor convoys, however, the flak was so heavy and accurate that it prevented an accurate bombing run. Five of the aircraft were damaged. Plan to block the enemies retreat. Bombs dropped, but no confirmed hits on targets. An outflanking movement by allied ground forces above Naples is causing the withdrawal of German forces along this main highway. The results of this mission have been reported to be successful. Although, it cannot be determined if the Formia Highway was rendered completely unserviceable, crews observed many strings of bombs landing toward the two aiming points. No flak or enemy aircraft were experienced. Many direct hits were reported in the center of the road junction. A road junction one mile west of the target was cut by bomb hits, as well as another road junction just east of the target. Complete weather coverage at the target caused the flight to return without dropping its bombs. Bombs hit directly across the field and into hangers and buildings on its north side. Several aircraft parked near the hangers were hit. Bombs also struck in the dispersal areas, causing at least 6 planes to burst into flames. One string of bombs which fell short of the target cut railroad tracks. A submarine was sighted when flying to target. It was headed toward Lido di Roma. The railroad tracks were bombed between a road junction at 42 23’ N – 11 27’ E and a lake at 42 24’N – 11 23’ E. The tracks were reportedly severed in three places. At least three direct hits were made on the tracks just west of a road junction and 6 direct hits on the tracks just east of the lake. Black smoke was seen coming from a bombed area on the tracks near the east end of the lake. Many near misses were reported. Considerable dust and smoke covered the target area, making observations difficult. Post mission photographic analysis, revealed three direct hits on the bridge and one hit each on the approaches to the bridge. Bomb hits were concentrated around the bridge, with several strings cutting across it. Other strings of bombs blasted the north and south approaches. Flight turned back due to unfavorable weather conditions in the target area. Sadly, there were no bombing missions flown in November 1943, but they did do training flights. It was on one of these training flights on November 4, 1943 that James Albert Kurtz was killed. News was received today from Oudna of an airplane accident in which 2nd Lt. James A. Kurtz and F/O Charles (NMI) Hudson Jr. were killed. They were on a routine training flight , and had been flying formation over Tunis at 2000 feet with a pair of B-17’s, in the left wing position. They pulled out of the formation and were flying straight and level when their B-25 suddenly went into a dive and then began to spin. The plane crashed and burned about 5 miles NW of Oudna A/D #2. No one else was in the plane. They were buried at Tunis in the late afternoon. James Kurtz’s bombing missions coincided and supported the invasion of Italy and their surrender to allied forces. Much of his mission activities were meant to limit German retreat from Italy and their supply lines. These bombing missions were very successful and were important to the Allied troop’s success in Italy. Here is a picture of James Kurtz and a flight crew. I am not sure if this was taken in Tunisia or during his training in Alabama. I suspect that this may have been taken during his training in Alabama. The trees in the background look more like the southern United States vs. what I would expect would be a more arid environment in Tunisia. Please let email me if you have any information about the men in this picture or the men that James Kurtz flew with. It would be very interesting if they have any personal stories about serving with my great uncle. The source of this bombing mission information was previously classified /secret mission logs which are posted on the following website. I am thankful that they have published this information on the web for everyone to access. There is no question that George Washington was the true father of our country. His tireless leadership in the American Revolution was critical to the successful forming of our country. He is the only US President to ever be unanimously elected by the Electoral College (100% of the electoral vote). He set precedence in almost every area of the office of President which every US President has followed since. What he did which was truly remarkable was that after two terms as President he stepped down and relinquished power. He did not run for a 3rd term. No revolution. No coup. No hand-picked successor. Just an orderly transfer of power through popular election. It is possible that this was the first time this had occurred since the pure democracies of ancient Greece. 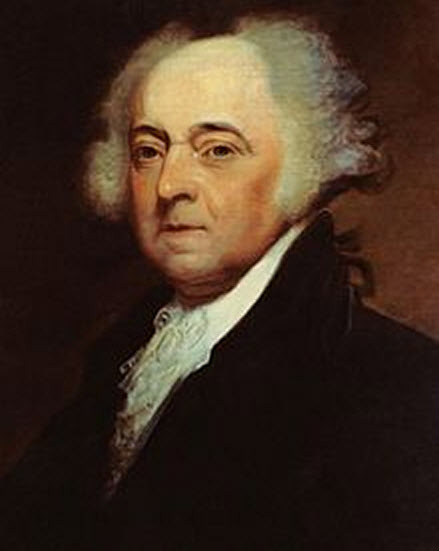 His Vice President, John Adams, won the 2nd presidential election vs. Thomas Jefferson. John Adams was a revolutionary patriot, founding father and my distant cousin. President John Adams and I share ancestors, Thomas Gardner and Lucy Smith. Thomas Gardner and Lucy Smith were my 8th grandparents and President Adams' great-great grandparents. This makes President Adams my 3rd cousin 6 times removed. So not a close relative. Here is the relationship in a little more detail. I have covered the relationship to John Armstrong and Betsey Woodbury extensively in my blog. Did I happen to mention that President Adams' son, John Quincy Adams went on to be our 6th President? When you find you are related to someone (even distantly) it does increase your interest in that historical figure. One of John Adams earliest known impact on history involved a famous event, but his role in that event is not nearly as widely known. The event was the Boston Massacre. On March 5, 1770, British soldiers stationed in Boston shot and killed 5 civilians and wounded 6 others. British soldiers had been stationed in Boston due to increasing unrest in the Massachusetts Bay Colony. As the name "British Massacre" would infer, there was widespread outrage over the killing of civilians by the soldiers and the populace of Boston wanted to see the offending men hanged. The British soldiers maintained their innocence that they fired in self-defense. There was little chance of them receiving a fair or unbiased trial in Boston. During the trial, the future Pesident was able to root out the actual series of events which led to the shooting. The incident started when a group of men were harassing a British soldier named Private Hugh White standing guard duty outside the Custom House on King's Street. The men and the private exchanged insults. The private struck one of the men and a mob started to form. Over 300-400 people of Boston started to hurl insults, snow and small objects at the soldier as other soldier arrived to support him. The crowd taunted the soldiers. It is even said that some of them shouted, "Fire!" The soldiers stood their ground and waited for commands from Captain Thomas Preston (who stood in front of his line of men). No command was given to fire. An object struck Private Montgomery, knocking him to the ground. It is stated that he got up and shouted, "Damn you, fire!" and shot into the crowd. From there one of the civilians hit one of the soldiers with a club and it unraveled quickly. Without orders some of the soldiers shot into the crowd. The main issue to be decided was did Captain Preston order his men to fire on unarmed civilians as the people of Boston believed or was this a question of self-defense. The trial began in November 1770 and John Adams was able to prove to the jury that they had to treat the British soldiers not as despised British, but as any men accused of such as crime. He convinced the jury of the evidence that these men were threatened and if they were guilty of anything it would be manslaughter and not murder. In the end, Adams prevailed and six of the soldiers were found innocent of any wrong doing and two others were found guilty of manslaughter. Try to think of the times and the quality of the man who was John Adams. Revolutionary feelings were growing and the British were reviled in many parts of Boston. It would have been easy to get caught up in the fervor of the times and wish ill on these men. Watch innocent men hang. Unlike when the revolutionary feelings and events were rushing toward a Declaration of Independence, at this time and in this event, John Adams stood alone to stand for truth and justice. He showed a level of integrity which is always in short supply, whatever the time period. It is heartening to know that a few of the genes that made him a man of such sterling integrity also are a part of my make-up. Something to be proud of and something to remember when I am confronted with ethical problems and it is time for me to wonder, "What would John Adams do?" 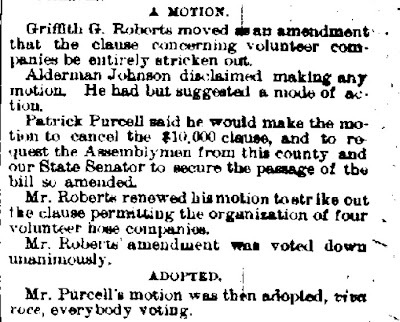 In previous posts I referenced my wife's great great grandfather, Patrick Purcell. He came to this country from Upperchurch, Tipperary, Ireland about 1850 and settled in Utica, NY. I believe he came to the US by himself and stayed with cousins (possibly the McGraw's of Syracuse). According to Patrick's obituary three of his sisters also came from Ireland to upstate NY. The obituary identifies them as Mrs. John Lynch of Utica and Mrs. John Connolly and Mrs. James J Harvard both of Oneida, NY. I wanted to research Patrick's sisters and see if that led to any clues about the Purcell family of Ireland. Have you noticed how great it is that women were just referred to as "Mrs.” husband's name :-). No reason to make it easy to to uncover relatives. Finding the sisters living in Oneida proved to be difficult. I looked extensively for any Connolly and Harvard families in the small community of Oneida. No luck. I did find a newspaper notice that mentions several Purcell family members attending the death of Mrs. Connolly in 1899 in Oneida. So I did know that she died there. A breakthrough came when I found another Ancestry.com tree which had a Connelly family living in the town of Lenox (which is near Oneida). What I did know at the time was that Lenox became a part of Oneida a few years later. The family in on other family tree was spelled a little differently, but that isn't unusual and did look promising. The family was identified in the 1880 census as John and Mary Connelly. How could I know if Mary was Patrick's sister? Luckily, I found on the findagrave website records of burials in Oneida and there it was....Mary's grave was engraved Mary Purcell Connelly. No doubt that I had found her and that she was Patrick's sister. Mrs. Harvard, I am less sure about. There was no Harvard family in Oneida. I had two hunches: the Harvard name was wrong and the fact that Patrick’s sister may have been named Margaret. The name Margaret came up again and again in the Purcell family and it seemed reasonable that one of the sisters was probably named Margaret. One trick I use in my genealogy research is to search for potential family members living on the same street as known family members when reviewing the US census. Families used to cluster together. I think it paid off in this case. I found James J Howard and Mary Howard living on the same street as Mr. and Mrs. Connelly. Howard and Harvard could easily have been mixed up in the obituary. Hhhm...was it possible that it should have been Margaret on the census instead of Mary, but they transcribed the census record in error? Upon review there was no error, but this still seemed to be my best lead, so I didn’t give up. I had success, once again with findagrave.com where I found the Howard family plot in Oneida. Guess what? There was a grave a Margaret Howard and one for Mary as wive's of James. It appears that Margaret was James' first wife. Is this Margaret Patrick's sister? I don't know for sure, but there seems to be good circumstantial evidence to support that she is Patrick's sister. Patrick's third sister was the easiest to find and proved the most fruitful. I found that Mrs. John Lynch was in fact, Julia Purcell Lynch. I found her obit from when she died in 1925 at the age of 85. 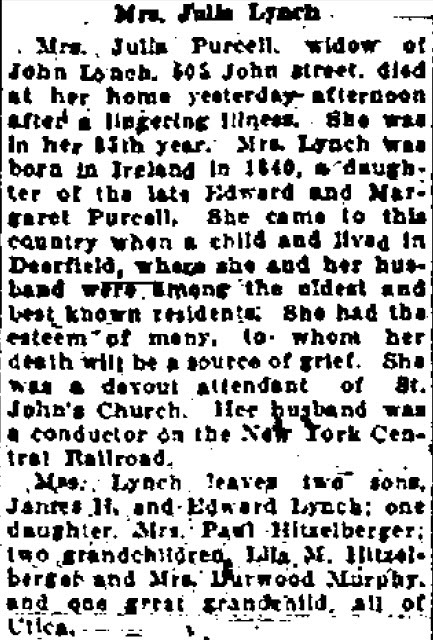 Probably the most important piece of information this obit provided was the names of Julia's parents - Edward and Margaret Purcell. The fact that their names are revealed as Edward and Margaret makes a lot of sense. These names reoccur with many of the Purcell families descended from Patrick and his sisters. The next step in this journey is to "jump the pond" and see what I can find from the good people of Upperchurch, Tipperary. I have never been a huge fan of Forest Gump, but there is no disputing that genealogy research is "like a box of chocolates", because you never know what you are going to find. I have been focusing a lot of my time researching the Armstrong line of my family living in Cape Elizabeth and Falmouth (now Portland, Maine). I have traced the Armstrong family back to the early 1700's, but have hit a road block and I am hoping that there are some other distant relatives which will may have some information which can help me break through. However, in the meantime, I have been researching Betsey Woodbury Dyer Armstrong's family. I have multiple post on Betsey Woodbury Dyer Armstrong including: Betsey Armstrong Probate Mystery, Armstrong Family Land Division - 1897, The Armstrongs and Woodburys of Cape Elizabeth. Betsey Woodbury was born Nov 16 1787. Her parents were Israel Woodbury and Anna White Woodbury. She married her first husband, William Dyer, Sept 27, 1804. She was only 16. They had at least three children: Woodbury, Benjamin and William Dyer. Her husband, William, died sometime between 1813-1817. On Nov 1, 1817, she married her second husband, John Armstrong. They had at least eight children: Simon, Mary, Eben, Lucy, John B, Israel, Arthur and George. Betsey had at least 9 siblings: Hugh, Jane, Lucy, William, Christina, Jonas, Israel, John and Anna. I will be making more blog posts on Betsey's mother family as they have some historical significance and some very interesting stories. Today's post is about Betsey's brother, Captain William White Woodbury. He died April 29, 1861. Those of you who have researched in Maine, you know how rare it is to find any significant obituaries prior to 1900. It is typical to find a death notice that says little more than the name and date of someone who has died. So I was very excited to uncover such an information rich obituary for Captain Woodbury. Woodbury, William, Portland, April 29 at 90. He arose on Monday morning at his usual hour and partly dressed himself; in two hours after, he was dead. Capt. Woodbury was a descendant of John Woodbury, one of the Cape Ann company, who went to that place with Roger Conant in 1624; he afterwards settled in Beverly, Mass., from which the immediate ancestor of our deceased friend, Joshua Woodbury, came to Falmouth in 1727, and settled at Cape Elizabeth. The parents of the deceased were Israel Woodbury and Ann, dau. of William, and dau. of Rev. John White of Gloucester, Cape Ann. He was born on the old White farm near Simonton's Cove, at Cape Elizabeth, Oct. 2, 1772 (Maine records show DOB as Aug 4, 1772). The Whites were ancient settlers at Cape Elizabeth; they occupied farms there previous to the Indian war, in which one was killed, and their land descended from their family to present day. Capt Woodbury was long a successful shipmaster; afterward, he engaged in commercial pursuits on shore; was a prime mover in establishing the Marine Railway, incorporated in 1826; he conducted it near thirty years, until it closed its affairs. He was many years President of the Marine Society, and twenty-seven years President of the Merchants Bank of Portland, holding the office at the time of his death, and having been a Director from its incorporation in 1825. He married in 1798 (Maine records show Nov 17, 1797), Mary, dau. of Capt William Hoole, who went to Portland from Boston just previous to the Revolution, which whom he has happily lived more than sixty-three years, and by whom he leaves one son and five daughters. She survives to lament her faithful and long-cherished companion. Capt W. was a man of most determined will, of sound judgement, of great discernment, and inflexible integrity. One of the great benefits of this obituary for my research was that I was trying to confirm that Betsey's mother Anna or Ann White was related to Rev John White of Gloucester. This obituary was able to confirm this for me. In addition, since the obituary was written at the time of his death, that I can have a high level of confidence in its accuracy. The fact that I can confirm my lineage to Rev John White opens up some very interesting genealogy. More on that to come in future posts. Czekam aby połączyć się z członków rodziny Zembko na całym świecie. Proszę o kontakt, jeśli są związane z rodziną Zembko z Polski. Proszę napisz do mnie klikając na ten link. My wife's father's family is named Zembko. The Zembko surname is very rare in Poland and the United States. I can't be sure of the accuracy, but I found a website which claimed that you could type in a Polish surname and it will provide you areas on a map of Poland where that surname is present. According to this website, there are less than 100 people in all of Poland with the last name of Zembko. It shows the majority of Zembkos in Poland live in the area near Bialystok. In the United States, I am aware of only two families with the Zembko surname. One originated from Zembkos who settled in New Britain, Connecticut (I have not been in contact with them) and the Zembko family who settled in Nassau County (Long Island), New York. It is almost certain that these two families are related, but I am not aware of anyone successfully linking them. The patriarch of the Nassau County NY Zembkos is Franciszek "Frank" Zembko. My research suggests (but is not certain) that Franciszek Zembko was probably born is a small town named Złotoria, Poland, near Bialystok, between 1882-1885. At that time, this region of Poland was under Russian control and the Russians made it difficult for the Polish people. One family story which has been handed down indicates that Franciszek's parents (names unknown), were thrown down a well by Russians as a way of intimidating the local townspeople. Frank arrived at Ellis Island in April 1901, the passenger list record indicates he was coming to live with his brother-in-law in Mineola, NY, but I am unable to decipher the name on the record. I have included a reproduction. Any ideas? Something...Gonsb or Gonsbly...really no idea. Franciszek found work as a gardener on one of the many multi-million dollar luxury estates in Locust Valley, NY. He lived in Glen Cove, NY which was very close to where he found employment. In 1906, he married Bronislawa "Bessie" Bartosiewicz at St Hedwig Polish Roman Catholic Church in Floral Park, NY. They had 7children: Benjamin, Jean, Chester, Walter, Regina, Henry, Thaddeus. All born in Glen Cove and Locust Valley, NY. Frank Zembko died in 1935. I am not aware of any communication between the family and any relatives back in Poland, but there was probably some correspondance. If you have a connection to the Zembko family from Poland and now live in the United States, Poland or anywhere else in the world, please contact me. I would love to hear what you know about the family history and where you are now. If I get enough interest, maybe I can create a global website for the Zembko family. Mojej żony ojca rodzina nazywa Zembko. Nazwisko Zembko jest bardzo rzadkie w Polsce i Stanach Zjednoczonych. I nie możemy być pewni dokładności, ale znalazłem stronę internetową, która twierdziła, że ​​można wpisać polskiego nazwiska i będzie dostarczać Wam obszary na mapie Polski, gdzie, że nazwisko jest obecna. Według tej strony, jest mniej niż 100 osób w całej Polsce z nazwiskiem Zembko. To pokazuje, że większość Zembkos w Polsce mieszkają w okolicy, nieopodal Białegostoku. W Stanach Zjednoczonych, zdaję sobie sprawę z zaledwie dwóch rodzin z nazwiskiem Zembko. Jeden pochodzi z Zembkos którzy osiedlili się w New Britain, Connecticut (nie byłem w kontakcie z nich) i rodziny Zembko którzy osiedlili się w Nassau County (Long Island), New York. Jest niemal pewne, że te dwie rodziny są ze sobą powiązane, ale nie jestem świadomy ktoś z powodzeniem łącząc je. Frank przybył na Ellis Island w kwietniu 1901 roku, zapis listy pasażerów wynika, że ​​zbliża się żyć ze swoim bratem-in-law w Mineola, Nowy Jork, ale nie jestem w stanie rozszyfrować nazwy na płycie. Mam włączone reprodukcję. Jakieś pomysły? Franciszek znalazł pracę jako ogrodnik w jednej z wielu luksusowych posiadłości milionerów w Locust Valley, Nowy Jork. Żył w Glen Cove, Nowy Jork, który był bardzo blisko miejsca, gdzie znalazł zatrudnienie. W 1906 roku ożenił się Bronisławy "Bessie" Bartosiewicza na św Jadwigi Polskiego Rzymsko-Katolickiego Kościoła w Floral Park, NY. Mieli X7children: Benjamin, Jean, Chester, Walter, Regina, Henryk, Tadeusz. Wszystko urodził się w Glen Cove i Locust Valley, Nowy Jork. 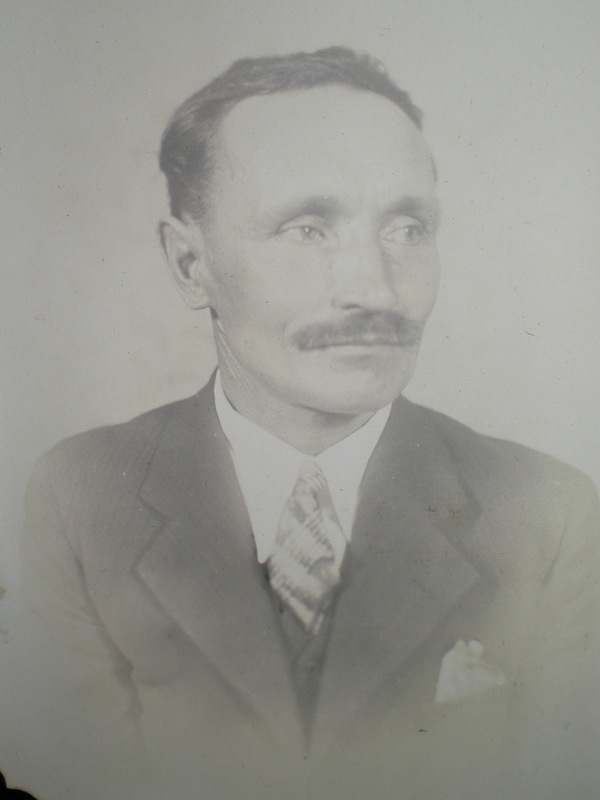 Frank Zembko zmarł w 1935 roku. Nie znam żadnej komunikacji między rodziną i wszelkich krewnych z powrotem w Polsce, ale nie było prawdopodobnie niektóre komunikacji. gdziekolwiek indziej na świecie, proszę o kontakt. Chciałbym usłyszeć, co wiesz o historii rodziny i gdzie jesteś teraz. Jeśli dostanę tyle zainteresowanie, może uda mi się stworzyć globalną stronę internetową dla rodziny Zembko.